We received an awesome number of entries from some truly amazing .nyc businesses in the inaugural Best of the Boroughs. We are thankful to the entire .nyc community for their participation and engagement. Entries for next year open September 2019. If you’re interested in staying up to date on Best of the Boroughs news and promotions please sign-up for our newsletter here. Don’t forget to check out our Winners Gallery for the 2018 Borough winners. NYC Best of the Boroughs celebrates the local businesses, organizations and community individuals that make our city, and each borough, a unique place to live. What inspires your work? What drives your passion? And what makes your .nyc the best of your borough? If you own a .nyc web address, enter now and share your NYC story. What is Best of the Boroughs? 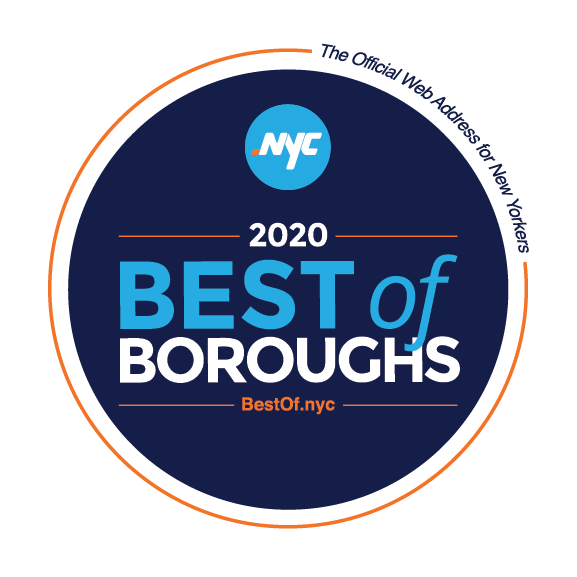 Best of the Boroughs in a citywide contest that celebrates the local businesses, organizations and community individuals that make our city, and each borough, a unique place to live. These individuals love the City so much it’s in their web address. Entrants across NYC will submit applications on what makes their .nyc business, website, store, organization or idea the best of their borough. There will be one winner chosen from each of the five boroughs and named the Best of Bronx, Brooklyn, Manhattan, Queens or Staten Island, depending on the borough in which they reside. Any business or entity with a working .nyc website in use prior to 9/4/2018. Judging criteria is based on general public appeal, the value to local community and economy, the history and story of the individual business as it relates to the greater good of the New York City community, and the overall experience of the .nyc website. Interested .nyc owners will submit their individual stories on what makes their business or entity the best of their borough through the online submission portal. Submissions will be accepted September 4-19, 2018. The goal of this Contest is to celebrate the use of the .nyc web address, and inspire local discovery of people, non-profits, companies and others using the .nyc domain. The winner from each of the five boroughs will be received a $5,000 cash prize and be featured in future marketing efforts for .nyc. $5,000 cash prize will be awarded to the winner of each borough. There will be 5 winners total with one dedicated winner per borough. Feature in .nyc marketing campaign highlighting your business. Official Best of the Boroughs award, reinforcing your business as best of its borough as decided by the community and local borough representatives. The most successful entries will display a genuine relationship with their local community and neighbors. The odds of winning depend on the number of eligible entries received. Judging criteria is based on general public appeal, which will take into account the number of votes for each business received during the open public voting period. History and story of the individual business or entity as it relates to the greater good of the New York City community. How does your business or entity contribute to the borough in which your reside. Quality of the .nyc website to include but not be limited to, visual aesthetics, content, functionality, structure and navigation. To learn more about the .nyc web address or find and register your .nyc domain, visit OwnIt.NYC today.